MoKo Microsoft Surface Pro 2017/Pro 4 Case, All-In-One Protective Rugged Cover Case with Pen Holder, Hand Strap, Compatible with Type Cover Keyboard for Pro 2017/Pro 4, Not Fit Pro LTE - BLACK | Replicafer Co.
MoKo All-In-One Rugged Case - Well built to protect Your Microsoft New Surface Pro 2017 / Surface Pro 4 for the years to come. - Compatible with Type Cover Keyboard. - Built-in hand strap for carrying on the go. - Raised Bezel & Non-Slip Elastic Strap offers enhanced protection. - Surface Pen Holder Ensures a safe storage of your precious surface pen. - Made of Premium soft TPU and strong PC ensures protection and durability. 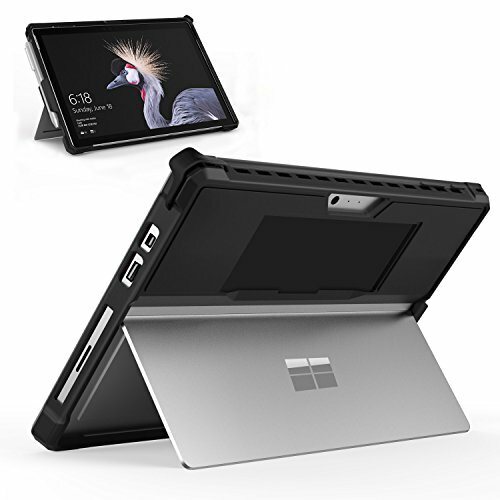 - A unobstructed cutout specifically designed for surface kick stand, buttons, ports and cameras! QUALITY MATERIAL - Premium soft TPU and strong polycarbonate offer superb protection against daily use. FUNCTIONAL DESIGN - Built-in Silicone Hand Strap for conveniently carrying. Come with Surface Pen Holder that allows you to keep pen securely in place! TYPE COVER CHANNEL - For easily attaching and detaching of keyboard without taking off the case. EXCELLENT PROTECTION - Non-Slip Elastic Strap keeps your type cover folded and secure on the go. Raised Bezel protect your precious device from drops, bumps, scratches.